Ives Concert Park is conveniently located off I-84, exit 4, making us easily accessible from all points in Connecticut and Putnam, Westchester and Rockland counties in New York, as well as New York City. We can be reached by Housatonic Area Transit (HART) buses and Metro-North trains. To reach us by car, use 43 Lake Ave. Extension in Danbury to program your GPS. Take Exit 4 off I-84; turn right onto Lake Avenue. Travel approximately one mile to WCSU Westside campus entrance on right. Ives Concert Park is at the top of the hill, on the left, just across from the O’Neill Center. 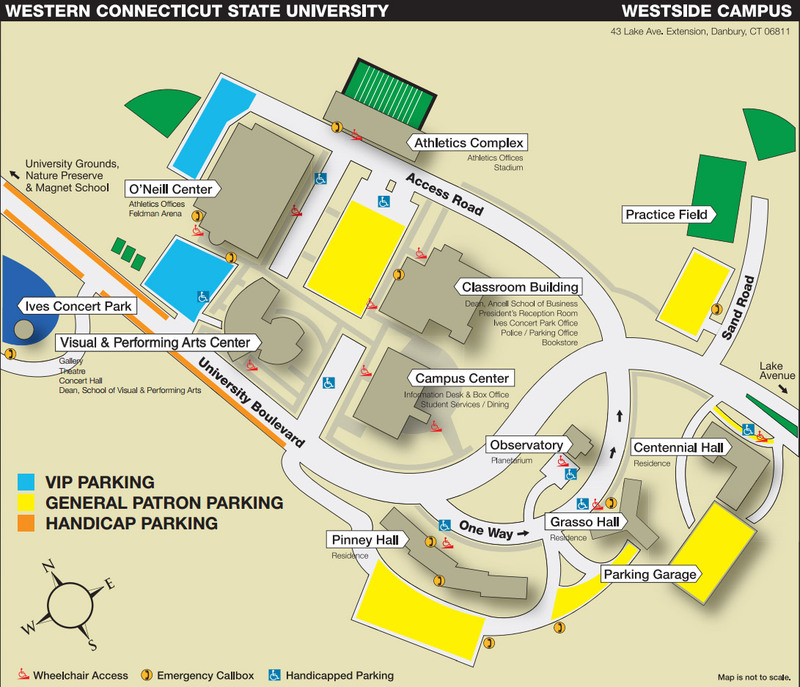 Parking for VIPs is in the two lots adjacent to the O’Neill Center; general parking is available in the lot at the top of the hill on the right, in the garage behind Centennial Hall, in the spaces around Pinney Hall and in the lot adjacent to the Westside Classroom Building. Handicap parking is every space along University Boulevard (proper identification is required to park in handicap spaces).